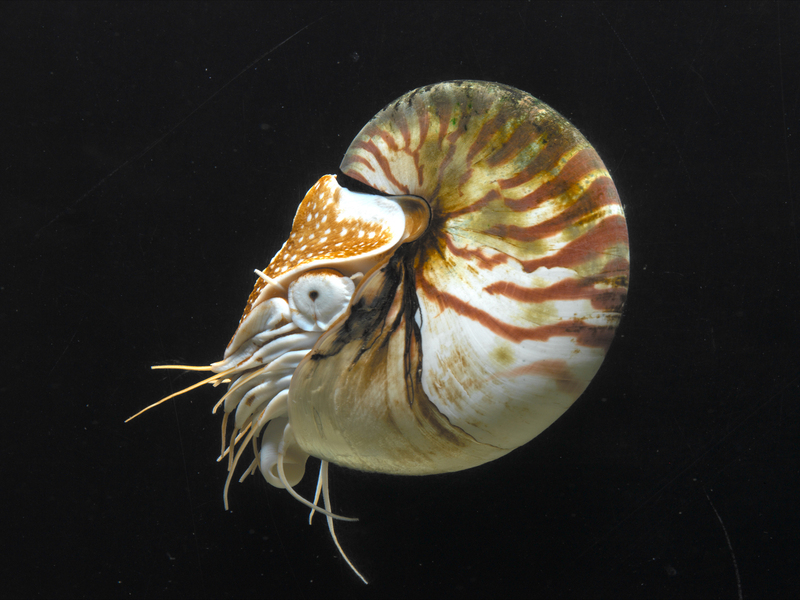 The nautilus is the only cephalopod mollusc that has a true exterior shell, but the animal only lives in the exterior compartment. The interior of the shell is divided by a large number of ceramic walls into different compartments full of gas to allow the nautilus to float. The animal regulates its floating by bringing in air or releasing water. It is recognised by its spiral shell with bright drawings, and there are 5 or 6 different species. Its usual size is some 20 cm. The nautilus is usually solitary. It is a carnivorous animal that eats other molluscs. It has up to 38 tentacles, set out in two crowns, internal and external, which do not have suckers, but segregate sticky mucous to fix the prey better. The parrot’s beak jaws are sufficiently strong to break the shell of a bivalve. Its reproduction is oviparous and like all cephalopods, it has internal fertilisation. During the day they hide at around 400 m in depth and rest on the bed. At night they come to the surface and the lower shelf of coral reefs in search of dead animals and molluscs to eat. All the nautilus species live in waters of the Indian and Pacific Oceans. Do you know that Jules Verne used the name Nautilus to baptise the submarine in his novel 20,000 leagues under the sea? Because submarines, like the nautilus, flood some chambers with water to control their floating.